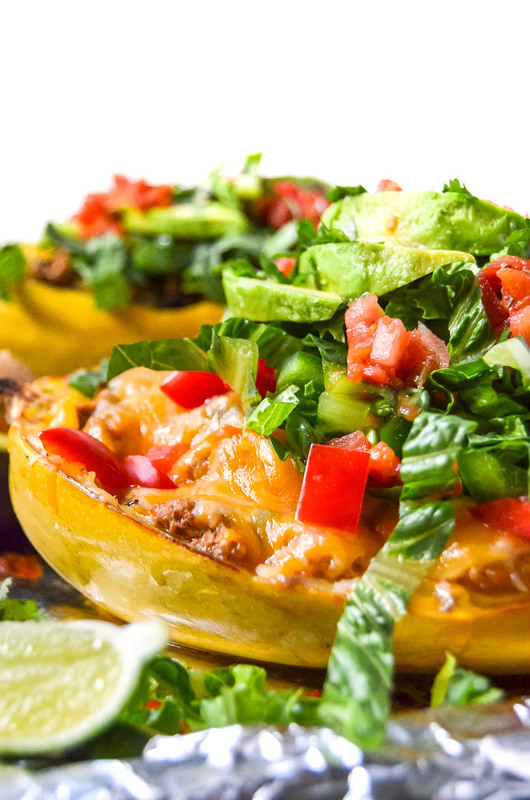 Turkey taco spaghetti squash boats is a great recipe to make for a guilt-free, low carb taco night. Perfect for meal preps and a hit among kids! When I think of spaghetti squash, I think spaghetti = Italian, right? So, that is pretty much all I have done when cooking spaghetti squash. I have made shrimp alfredo, chicken parmesan, and the classic marinara to name a few, but it never occurred to me to use spaghetti squash in a different way. After posting a poll on my IG, it turns out many of you would like to see how spaghetti squash can be used for a Mexican inspired dish! Needless to say, after experimenting I was surprised at how spaghetti squash and Mexican flavors paired so well together! My husband was hesitant at first but it was love at first bite for him -- he now asks for these squash boats every week! Hey, if I can make this every week then I would be happy as a clam. For a #tacotuesdaynight, it has to be the easiest recipe to bake while preparing the toppings. While your spaghetti squash is cooking, you are preparing the meat mixture that goes inside the boats while prepping all the fun and healthy toppings. As soon as your boats are done baking, add all your favorite toppings and dig in! And the best thing when you’re done eating? You don’t have as many dishes to wash!! You can make this recipe kid-friendly by omitting/using less of the spicier seasonings. 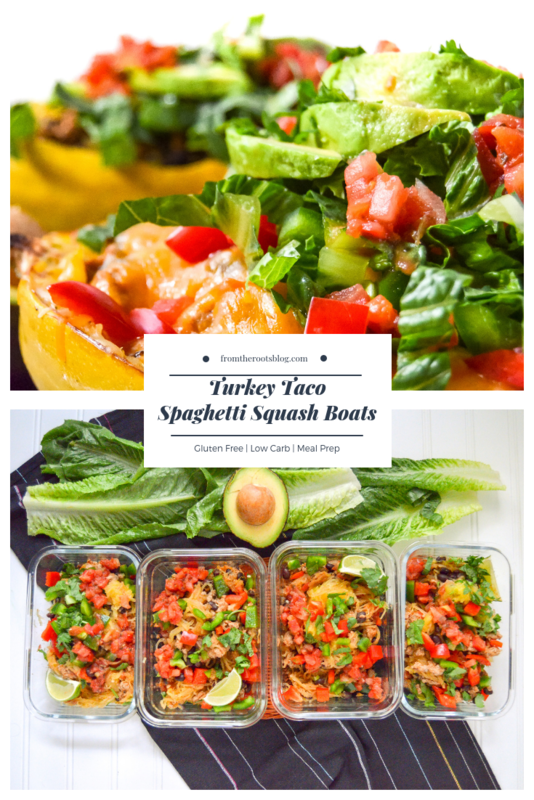 Other than that, these squash boats would be great to add to your taco night! With that said, you will find that this recipe can be customized to your preference. For example, in my hubby’s boat, I added extra beans and cheese while my boat sticks to the recipe but with 5 maybe 20 dashes of hot sauce (love my spicy food)! Preheat oven to 375 degrees. Slice squash in half lengthwise and scoop out the seeds. Drizzle halves with olive oil and season with S&P. Place squash cut side down on baking sheet and roast for 45-50 minutes. When done, use a fork to scrape out the squash flesh. While your spaghetti squash is cooking, make the meat mixture. Drizzle oil in a skillet on medium-high heat. Add the minced garlic to the skillet and saute for about 2 minutes or until fragrant. Add the ground turkey and cook until slightly pink, then add all of your seasonings, fresh salsa, and black beans. Turn the heat off and set meat mixture to the side. Transfer cooked squash flesh to the meat mixture and combine. At this point, taste mixture to see if you need to add more S&P/seasonings/hot sauce for personal preference. 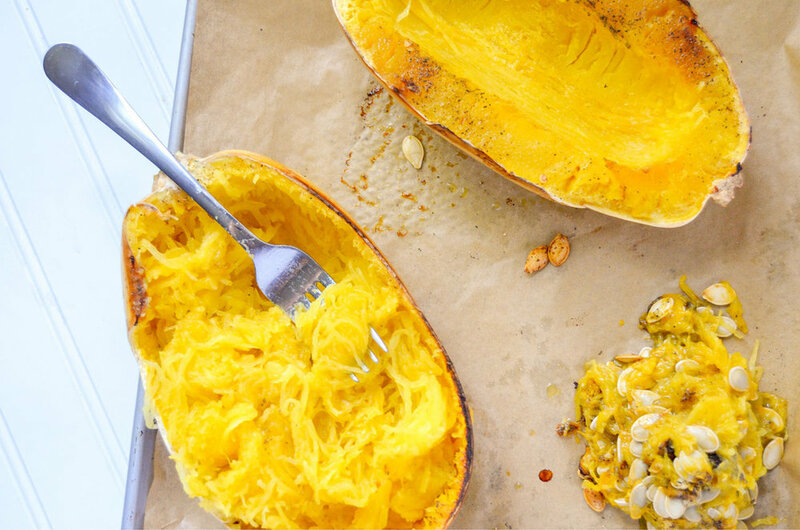 Transfer squash mixture to your now scraped spaghetti squash bowls and top with optional cheese. Bump up the oven temperature to 400 degrees and bake for an additional 5-10 minutes until your cheese is nice and bubbly or your naked boat is nice and warm. Pro tip: Place the whole squash in the microwave for 5 minutes for an easier slice! 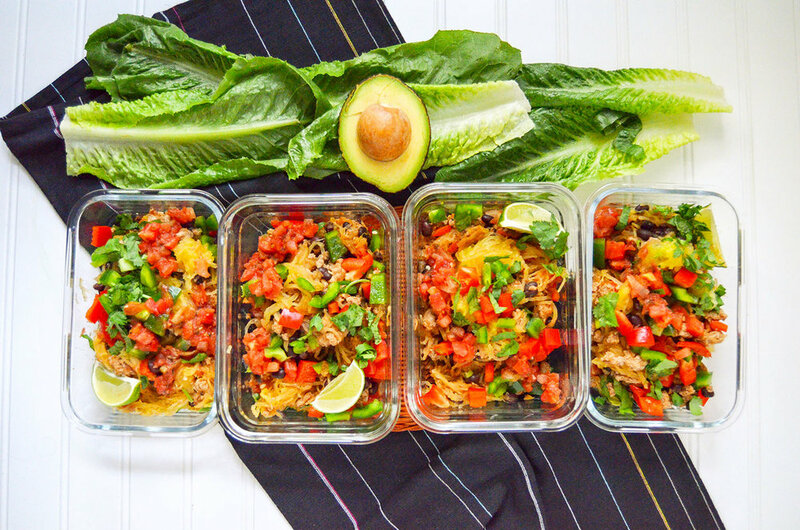 If you are using a smaller spaghetti squash, then use just 1 can black beans.